How long does it take to work through the approvals process for a redevelopment project? In the case of 205 Crichton Street – 15 Dufferin Road the process took: 3 years, 2 months, 26 days. 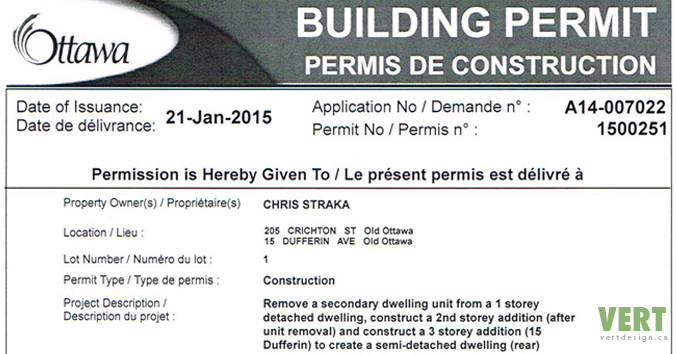 Although I have certainly completed the process on other projects more quickly, a complex and contentious project (involving multiple residential units, striving for LEED and Passive House green building certifications, on an infill property, within a heritage conservation district) in the City of Ottawa can take an inordinate amount of time. Granted, the timeline recounted below includes a 6 month period of dormancy and the births of two children. Notwithstanding the inevitable delays that life presents, the process requires: an understanding of the system, familiarity with the stakeholders at play, some technical ability, the support of a team of experts, financial resources, a vision for something better than what is there now, and (most importantly) a high degree of perseverance fuelled by the belief that what you want to do is right. What’s next? Construction is (finally) underway.